When the App Store launched in 2008, it provided an exciting new way for developers to distribute third-party apps and games on the iPhone. With the release of iPhone OS 2.0, developers were no longer constrained to web apps and could take advantage of the possibilities afforded through fully native apps. At the time, it was an exciting and opportunistic new chapter for iPhone users, developers and mobile gaming websites. As the App Store continues to grow in size, however, the landscape has begun to change. While the App Store was once a relatively even playing field, with a balanced mix of indie developers, mid-size studios and large publishers, the storefront now suffers from increasing disparity, a problem that is suffocating for many developers, enthusiast media publications and the broader ecosystem. The shift away from paid apps towards free apps monetized with in-app purchases or mobile ads has driven the popularity of addictive games such as Clash of Clans, Game of War, Candy Crush Saga and Kim Kardashian: Hollywood, and the deep-pocketed developers behind each title will go to extreme measures to ensure their continued success, even including unthinkably expensive Super Bowl ads. "iOS gaming has since been pushed to two extremes: The giant, multi-million dollar studios of the world, and supremely tiny indie developers hoping to catch lightning in a bottle with a surprise viral hit they built in their spare time. The mobile gaming megacorps are operating on a financial level that's hard to even fully comprehend, quite literally advertising during the Super Bowl, while the one-man indie studios typically can't even afford an artist to help them with a better app icon." 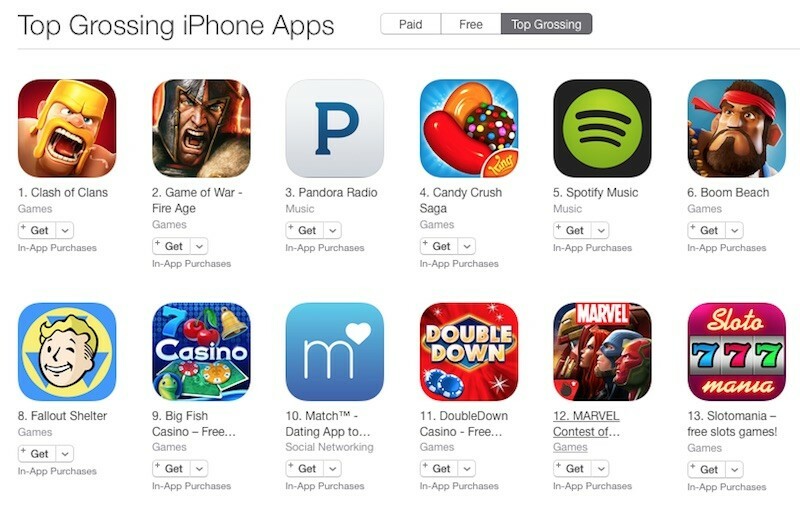 "The absolute most important thing for developers on the App Store in 2015 is chart positioning. There is nothing more valuable than being near the top of the charts, and with quite literally billions of dollars on the line across the iOS gaming industry, developers will do anything to climb the charts and stay there. This has given birth to an entirely new method of performance-based marketing known as user acquisition. In 2015's App Store, games typically aren't promoted through advertising on sites like TouchArcade and growing brand awareness in a traditional sense. Instead, developers pay countless different in-app advertising networks to just buy users and drive downloads directly." This is a significant problem for many indie developers, who do not have nearly the same budget or resources to put towards marketing, and do not gain considerable traction on their apps as a result. The disparity also places pressure on enthusiast iOS gaming websites such as TouchArcade, Slide to Play and Gamezebo, as large developers move away from traditional advertising and towards direct user acquisition. "We've been hit just as hard by this as everyone else, and unless developers wise up and recognize the importance of supporting the ecosystem, there won't be an ecosystem left to support. […] If the situation doesn't change soon, the landscape of mobile games journalism is going to look very different very soon -- and it won't be for the better." Of course, there are the "supremely tiny indie developers hoping to catch lightning in a bottle with a surprise viral hit," with Flappy Bird by Dong Nguyen being one of the most notable examples. 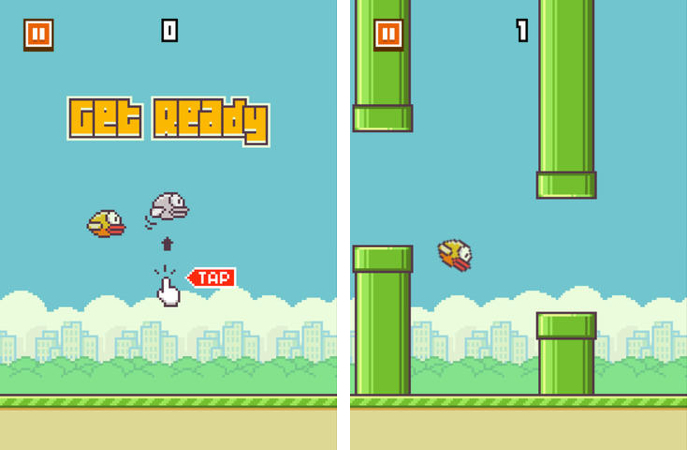 Flappy Bird soared to the top of the App Store charts in early 2014 and was earning Nguyen $50,000 per day in ad revenue before he removed the game due to the overwhelming attention he received. For many individuals whose jobs are dependant upon the App Store ecosystem, however, including developers and mobile gaming websites, making even a tiny fraction of the $50,000 per day that Nguyen was earning is becoming increasingly challenging. The lack of advertising income being collected by many of the affected publications is putting the future of their day-to-day operations at risk. "The mobile gaming press is getting the life squeezed out of it by the lack of advertising income," wrote 148Apps founder and Slide to Play author Jeff Scott on his personal blog Appivore, explaining how the editorial-developer relationship is broken. Apple, for its part, is shifting towards editorially curated lists on the App Store, but Gamezebo editor-in-chief Jim Squires believes that developers need to change the way they approach their App Store marketing efforts and stresses the importance of enthusiast iOS gaming publications. "Apple doesn't need to change the way they do things -- developers do. And it's happening. Monument Valley may have already been a big hit, but a brief mention in House of Cards saw a huge spike in downloads for developer ustwo. TIME Magazine selected inkle's mobile gamebook 80 Days as their Game of the Year. TIME Magazine. We need to meet consumers where they are at to convince them to download the software they want. But while it's hard for one of 500 games launching in a week to get a TIME feature, it's much easier to get a feature in a site like Gamezebo or TouchArcade. And those TIME writers? They read us. More importantly, there's good reason to believe Apple and Google do too. They count on sites like ours to filter out the filler and let the cream of the crop rise to the top." With few other options at this point, MacRumors sister publication TouchArcade has set up a Patreon page where readers, developers and other members of the community can help fund the website to ensure that its editorial staff can continue to cover the latest in iOS gaming. As of writing, the website has received nearly half of its $10,000 monthly funding goal that will help it remain sustainable in the months and years ahead. Those interested in learning more can read articles on TouchArcade and The Guardian. I think it's disingenuous to use the front page of MacRumors as a plea for cash for Touch Arcade, especially under such a thinly veiled title that people might mistake for a real Apple related news article. Oh, and slightly off topic (sort of), i think Apple need to do something about some of those in-app purchase games as some of them are simply adware bombs. You get 10 seconds of actual game and spend the next 30 seconds closing adverts. I really don't think that is what Steve had in mind when he agreed to an app store, and neither did we!! TouchArcade's situation may have been the inspiration, but we wanted to do a more complete story on what's been happening in the iOS games media industry, which is why we talked to folks at several similar sites. Would we be happy if people supported TouchArcade because they saw this post? Sure...after all, we know the staff members there (some of whom work for both sites) and love the content. But it's a much larger issue that also affects developers and users, and it's something we thought merited coverage. If we were simply looking to shill for TouchArcade, we would have done something a lot easier than putting all of this together. The list of apps would grow much smaller if underwhelming apps are pulled. No downloads in 12 months? Hasn't been updated since ios6? Ratings have been consistently 1star or less in 24 months? Pull it. Same, thought this was leading to an actual piece of Apple news/rumor. Felt awkward by such an obvious cap-in-hand plea. This would have been news about 5 years ago. The App Store has not been a place for independents in a long time. Agreed. "Our sister site is looking for donations" is easy enough and honest. A 'Newest Releases' section showing every new app would change this quite a bit.